LCN Legal’s ICA toolkit will save you hundreds of hours, by giving you tried and tested documents to use as a starting point, and giving you the peace of mind. Work with up to date templates that have been specifically created for the purpose of supporting transfer pricing compliance and corporate restructuring. Imagine that all your intercompany charges were supported by easy-to-read intercompany agreements which reflect international best practice. Imagine the peace of mind you will have, knowing that those agreements are robust and actually reflect the reality of how your group operates. Imagine that you had instant access to a well-organised and comprehensive online archive of signed agreements, whenever you need to respond to requests from tax authorities, regulators or auditors. Imagine having a clear roadmap to achieve all this, without unnecessary fuss or complication. I really like the format! It is very clear and easy to follow. Can you teach our lawyers to write so clearly? I wonder sometimes if they are being paid by the word. What does our ICA Toolkit include? Note: Documents are provided in English. Multilingual versions are available at additional cost. Toolkit packages including additional types of agreement are available on request. Annual subscriptions are also available for an additional fee covering ongoing updates to reflect OECD Guidelines and developments in international best practice. GBP 3,850 plus VAT per group per annum, payable annually in advance. Subscribers get automatic access to all additional English-language templates and training materials (including invitations to our seminars and webinars on related topics) which we make available during the period of their subscription. Subscribers have no obligation to renew their subscription, and retain the right to use all templates previously downloaded. To order your toolkit, email us at info@lcnlegal.com, or call us on +44 20 3286 8868. LCN Legal does not provide tax, transfer pricing or comparables advice. Our support complements that of your existing advisers. 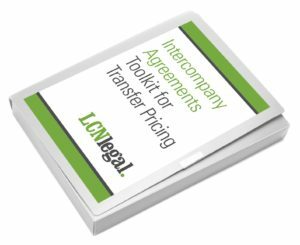 The LCN Legal Intercompany Agreement Toolkits are not a substitute for advice to suit the specific circumstances of your group. All orders will be subject to our terms and conditions, as well as our usual client identification and take-on procedures. I had extremely valuable assistance and advice from Paul, not only as regards general corporate law matters, but across a wide spectrum of legal aspects of SEWS-E Ltd group transfer pricing policies, implementation, inter-group agreements and legal compliance."